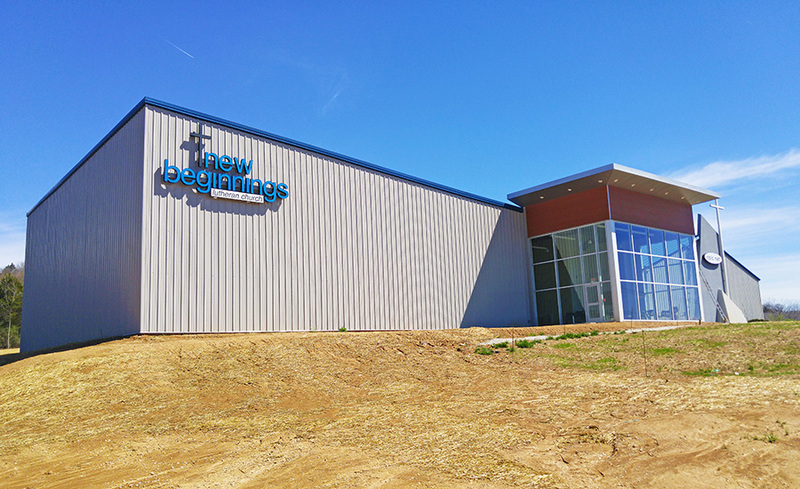 ST LOUIS, MO – Wiegmann Associates has completed HVAC work for the new 10,500-square-foot, one-story addition to New Beginnings Lutheran Church in Pacific, MO. Wiegman served as the design/build mechanical contractor. The general contractor was Wachter, Inc. and the architect was Etegra, Inc.
Wiegmann designed an energy-efficient HVAC system to serve the new sanctuary, fellowship area, restrooms and vestibule. Wiegmann installed ductwork, piping, rooftop units and exhaust fans. Wiegmann’s HVAC solution included an energy-efficient variable air volume system (VAV), equipped with fan terminal units for zone control. A Building Automation System allows the system to be operated remotely. New Beginnings Lutheran Church was founded in 2000. Wiegmann Associates is a St. Louis-based mechanical contractor and a national leader in design/build HVAC projects. Since 1995, Wiegmann Associates has engineered and installed innovative, energy saving and cost-efficient HVAC solutions, refrigeration systems and automation controls for clients in a wide range of industries, including senior living, food and beverage distribution, warehouse, healthcare, commercial and industrial. Wiegmann also provides 24-hour preventative maintenance programs and service in the St. Louis region. Wiegmann is ranked among the top 50 specialty contractors in the Midwest by Engineering News Record and the top 10 largest mechanical contractors by the St. Louis Business Journal. For more information, visit www.wiegmannassoc.com or call (636) 940-1056.